Through beauty the common good is nurtured, for humans are spiritual creatures who need much more than their daily bread. Our sense of place is inseparable from our sense of worth and so the places in which we live and the environment around us feeds our individual and communal well-being. That beauty is beyond politics or perhaps that politics is beneath aesthetics is the first misconception I want to confront. As their confidence has been eroded, politicians have retreated to where a less challenging, less ambitious, less thoughtful discourse prevails. Nervous about broaching matters about which they feel they can’t do much or don’t want to do much, they have failed to inspire those whose everyday lives have been blighted by the ugliness of the built environment they endure. The loss Oliver described is one I have regularly encountered, both in my role as Transport Minister and in the other offices of state I have held. Even the most obvious truth—the advocacy of the pursuit of beauty—is regarded with either disregard or distain. In part, this is explained by egalitarian hostility to those who judge the taste of others—for we are encouraged to believe that all is of equal worth regardless of how brutal, ugly or crass it is. Yet this does not have to be so. Through beauty, our ideals and what is real can be harmonized. Those who dare to make a case for beauty, elegance, grace or refinement are far from a public discourse brutalised by modern media and the consequent zeitgeist. We are forced to live in too many spheres which have been colonised, in Umberto Eco’s terms, by the Empire of Imbeciles. The crass preoccupation with utility becomes imbecilic as it descends to the defense of ugliness. Perhaps the most easily grasped and so persuasive counter to the zealous preachers of modernism is the relationship—understood for centuries but now neglected—between the simple, God-given beauty of nature and what man can do. The essence of Prince Charles’ case is that there are timeless principles of good design. Such an argument would for centuries have been regarded as a priori. Despite popular revulsion with much they have imposed upon us, those responsible—who rarely live where they have wrought havoc—viciously attack anyone who dares to articulate what most people know: that most of what’s been built in my lifetime could be demolished without aesthetic cost, and so bring the seductive benefit of leaving what was there before to stand proud. Through our appreciation of beauty, we come to terms with ourselves and others, as our senses are elevated by sensory joy. So, understanding the relationship between the built environment and well-being, I embarked on the mission, first highlighted in “The Journey to Beauty,” my speech last year to the Independent Transport Commission, to challenge the character of what passes for acceptable design in much road and rail construction of recent times. The best is bland. The worst is hideous. It is true, of course, that different interpretations of beauty have prevailed in different eras, but the abiding idea was once routinely accepted: that what is built should be dignified by style. Yet for at least fifty years, too often and in too many places, utility has been regarded as sufficient by callous architects, crass planners, and careless politicians. It’s not just that form has been shaped by function, but that style has been neglected altogether. As Energy Minister I acted to ensure that wind turbines were constructed in appropriate locations after proper consultation with local communities. Because little could jar more with the natural world or the man-made countryside than these huge concrete monstrosities. Consideration about the impact on landscape became a vital part of the approval process. And, mercifully, we cut the subsidies paid by taxpayers. Let’s now, once and for all, be clear. It is not beauty that changes but the ability of the beholder to appreciate it. This notion that beauty is relative has been used to justify much of the ugliness imposed on our towns and cities by architects, planners, and developers since the second World War. “Streets in the sky” were never a substitute for real streets, for homes on a human scale, in proportion and in harmony with their environment. A home is not “a machine for living in.” Ironically, these are the words, written in 1923, of the father of modern architecture, Le Corbusier. Homes are a reflection of our humanity. As William Morris said, “Have nothing in your house that you do not know to be useful or believe to be beautiful.” Morris understood that beauty and well-being are inextricably linked. And that a politics that is serious about people’s welfare and happiness must be serious about beauty. For the ancient Greeks, aesthetic and moral judgments were inseparable. In the nineteenth century, many artists considered beauty to be the vital link between freedom and truth. There can be once again a growing understanding of how aesthetics are a vital part of our judgment of value and worth, for people instinctively understand the connection between beauty and a wider conception of value. You see it in the love of natural, unspoilt places and the sense of shared ownership we feel for historic buildings. You see it in the protests against the ugly buildings that developers still attempt to foist on communities against their will. You see it in the despair at the way so many contemporary buildings are identikit, lacking any sense of craft or character, built with no consideration of the past and no regard to the future. Indeed, at the heart of modern architecture, like all modern art, is the Nietzschean idea that the past is irrelevant and that we can create our own value system. This is the second misconception I want to bury this evening, and not before time. It is not for nothing that the “hero” of Ayn Rand’s despicable book The Fountainhead is an architect. Much modern architecture fails precisely because it rejects those principles of design that time has taught us delight the senses. Where modern design does succeed it is largely by accident. Or because, where form has at least followed function, a building has a high degree of utility. In other words, we know something to be beautiful before we understand its function. When we perceive beauty, he wrote, our “senses and the imagination captivate the soul before understanding is ready either to join with them or to oppose them.” Our perception of beauty is not rational, it stems from the unconscious; from our deepest feelings and emotions as human beings. While the solipsism of the architect may be the driving force behind the drive to render much of our public space unsightly, it is our own denial of what our senses tell us that has enabled this desecration to take place. We have become so doubtful about the ability to make valid judgments about aesthetics, and even embarrassed by those who do, that we allowed ourselves to be ridden roughshod over by those who put profit and ego above all else. Too many remain hesitant about making aesthetic judgments. Respublica’s research has shown that people tend to focus on the details—“less litter and rubbish,” “vandalism and graffiti,” and less “vacant and run-down buildings” as important factors in making an area more beautiful. All these things matter, and we could do much more to address them. But which buildings will invariably be the shabbiest, the most neglected, and the most disfigured with graffiti? It will be the relatively modern buildings—those built within the past sixty years. Daubing graffiti is a crime, but the greater criminals are those that designed the modern structures which are the daubers’ canvas. And which buildings are invariably the most-obviously treasured? It is older buildings, shaped by vernacular style, where architects have taken care to be in harmony with the surroundings. Where craftsmen have laboured over detail. 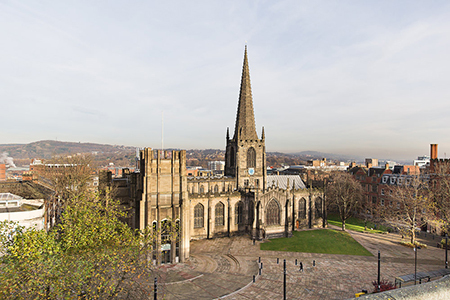 A study by the Commission for Architecture and the Built Environment (CABE) found that when respondents were asked to name the most beautiful buildings in Sheffield, most cited the two cathedrals. This brings me to the third and final misconception that I want to challenge: that beauty belongs somehow to the past. For it is often considered, sometimes unthinkingly, that it is no longer possible to build beautiful buildings. This is perhaps why increasing regard is given to the beautiful places and buildings that have survived intact. We have somehow, rather depressingly, come to believe that the supply of beauty is both finite and exhausted. This is perhaps because people assume that it must be somehow dated or even kitsch to build according to the principles of classical architecture. Or because they assume that beauty comes at too high a price, and must be sacrificed for the sake of utility. Both of these conceptions are false. When the city fathers of Birmingham, Nottingham, and Manchester built great town halls in either the neoclassical or Gothic revival style, they did so because they understood that these styles had endured. They wanted to build something that would last. And they succeeded. 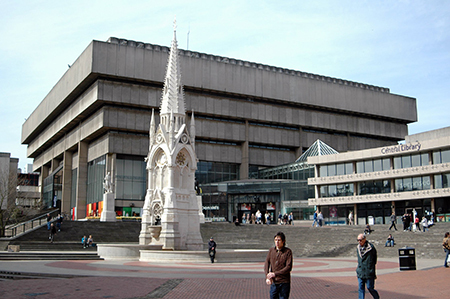 The modernist library in Birmingham’s Chamberlain Square has recently been demolished, just forty years after it was built—what a pity that its replacement couldn’t have been in keeping with its surroundings! No one would seriously consider doing the same to the neoclassical town hall, or to other great public buildings of the Victorian era. Yet, despite their appearance, these are in other respects modern buildings, built using modern construction techniques. In historical terms, they were built yesterday. There are no good reasons why we cannot continue to build beautiful buildings and public infrastructure. We spend so much of our time travelling—to work, to see friends and family. We must not resign ourselves to being miserable as we get from place to place. How we treat what is first well designed can make unsightly what was once beautiful. 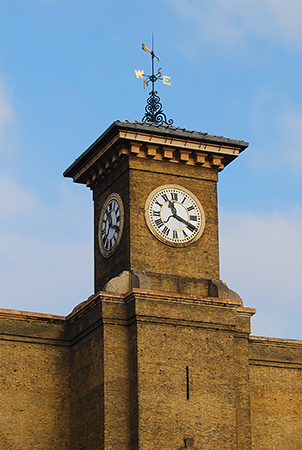 The railway network is rich with buildings and structures of aesthetic value drawn from the dawn of the railway age through to the sympathetic treatment of King’s Cross. In recent years, however, too often function has subsumed form leaving many of our cities and towns and much of our countryside scarred. As the great railway stations, bridges, and tunnels of the Victorian era demonstrate, while beauty and utility are not the same, they can be made to work in harmony. One does not have to be sacrificed for the sake of the other. Indeed, the willful excesses of modern and post-modern architecture are often far more expensive than buildings built and designed according to classical principles. It is our misconceptions we must now consign to the past. And, in their place, embrace a vision of beauty. To fill our hearts with joy. We shall doubtless encounter carpers and critics—too difficult, too expensive, too contentious—they will say. We will be tested in our resolve. There can be no surrender. We must triumph. The future deserves nothing less.